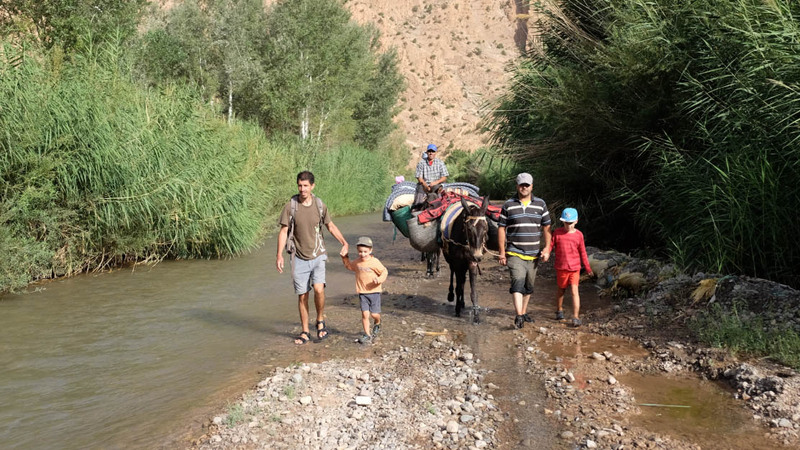 Tucked away in the Central Atlas of Morocco and below the stunning Mount Mgoun, the hidden Bougmez Valley still preserves a traditional way of life. 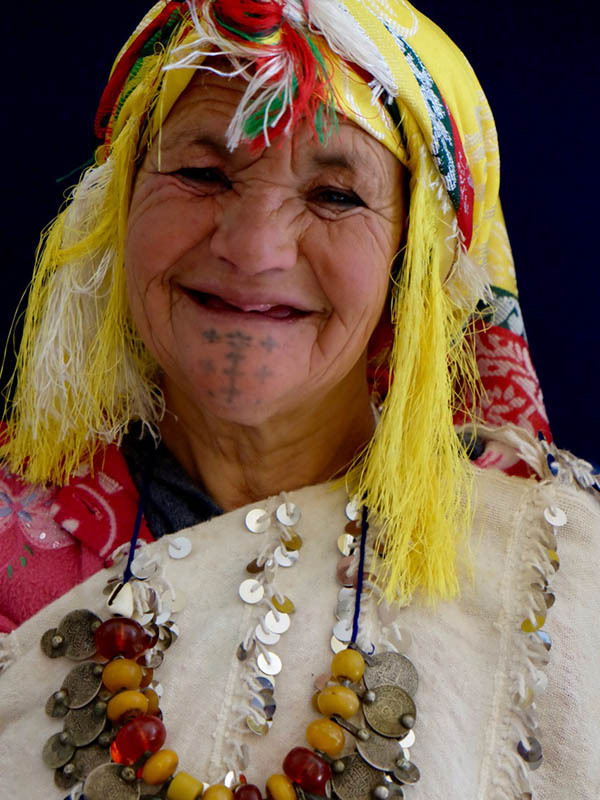 Offering a genuine cultural experience, the Bougmez is rich in agriculture, livestock farming and the local customs of the Berber. We stay in the superb Touda Eco-Lodge which offers the perfect base. At the Touda Ecolodge, every day the choice of program is yours to make depending on your mood and your level of physical fitness. We suggest a combination of sport and cultural activities ; go hiking through the magical the Ait Bougmez valley, climb the nearby untamed mountains (Azurki, Waouglzate), go cycling, etc. 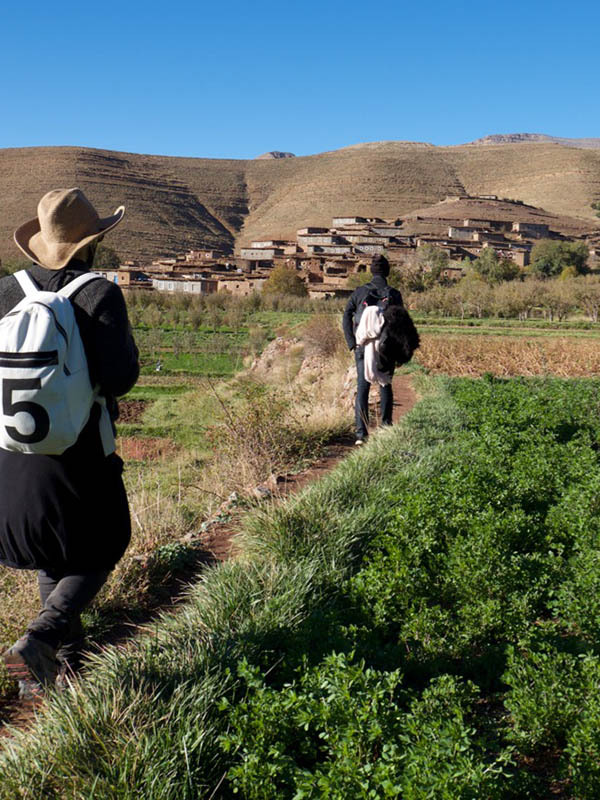 On your own or with a tour guide, the Touda Ecolodge proposes many hiking outings and trekking paths through the Moroccan High Atlas mountains, at your own pace and according to your wishes. 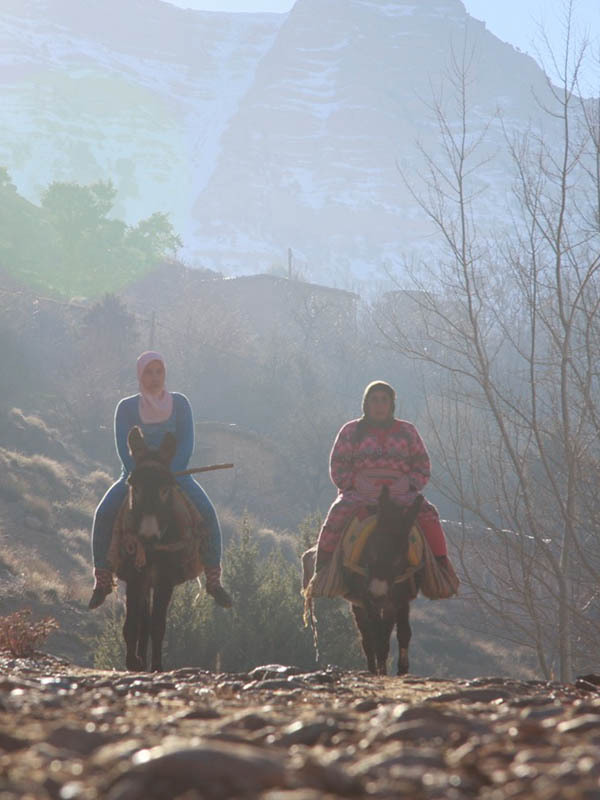 Magnificent landscapes from the most beautiful valley in the High Atlas. Accommodation : Touda Ecolodge and Riad. 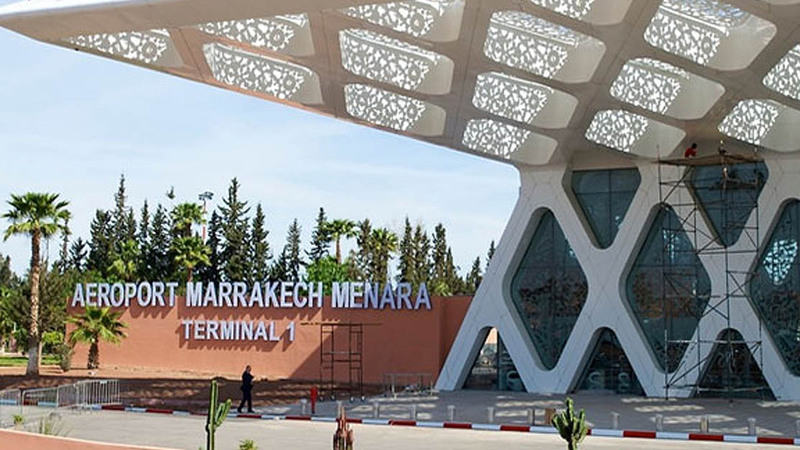 Greeting at the airport and transfer to the riad. Visit of the red city (depending on your hour of arrival). 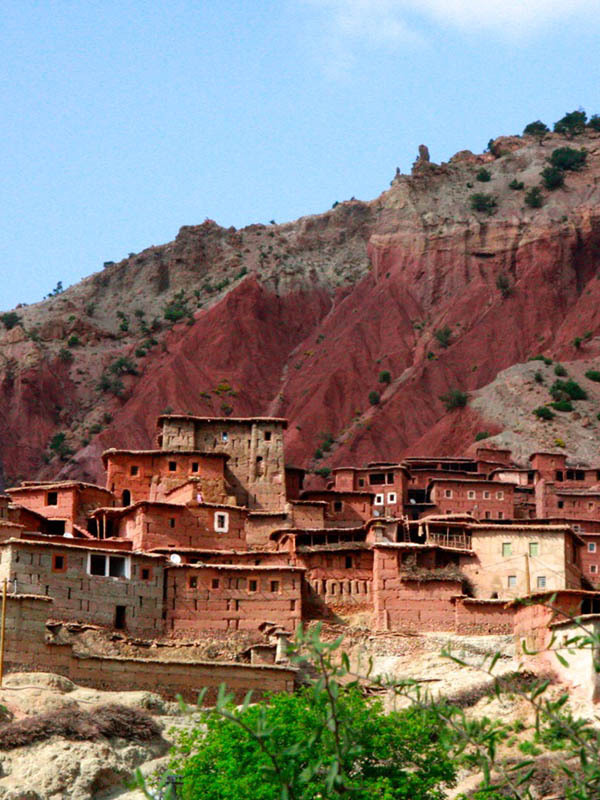 Through the road along the northern slope of the High Atlas, we reach the town of Azilal. 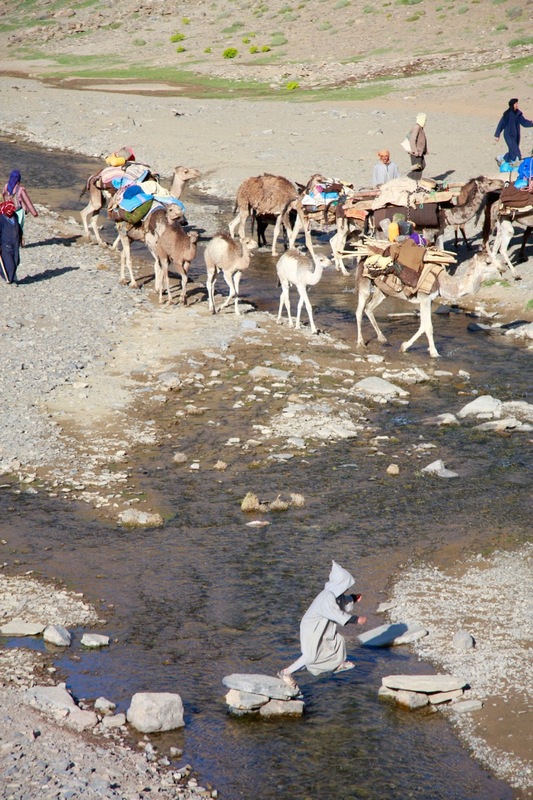 From Aït Mhamed, the road crosses a lunar plateau where nomadic peoples let their camels out to graze. Stunning view of the Wawgoulzat mountain range, whose highest point is 3,728 m.
We then descend through an old-growth forest of juniper trees to arrive at the village of Abat (1935 meters), where we will enjoy a picnic for the lunch, in the shadow of walnut trees. Passing through Ibakliwne, we will come upon a site rich in dinosaur traces. We finish the day with a visit of water mills in the village of Ait Imi. Our vehicle will be waiting for us at Tabant, the administrative center of the valley, to take us back to Touda Ecolodge. From a pathway overlooking the valley and cutting across a forest of juniper trees, we reach the Izourar plateau (2525 m), famous cross-road meeting place for the nomadic peoples « Ait Atta » during their transhumance. You will be welcomed by a nomadic family in their tent, where you will have the opportunity to discover their time-honored lifestyle. 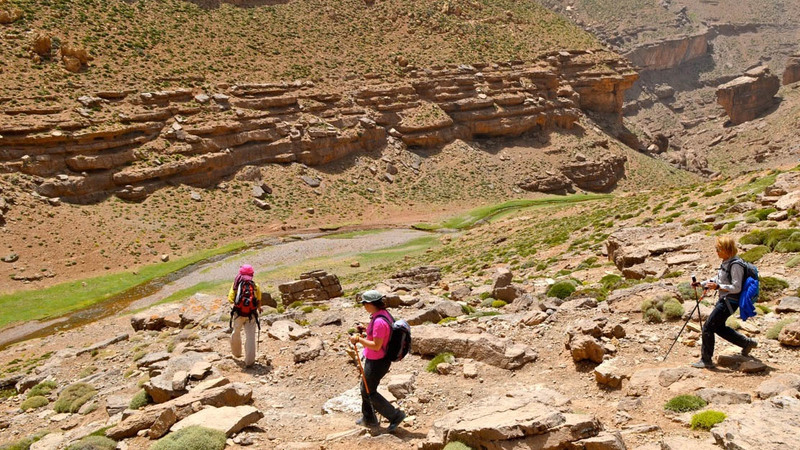 We return home through the spectacular Ait Ouham canyon. 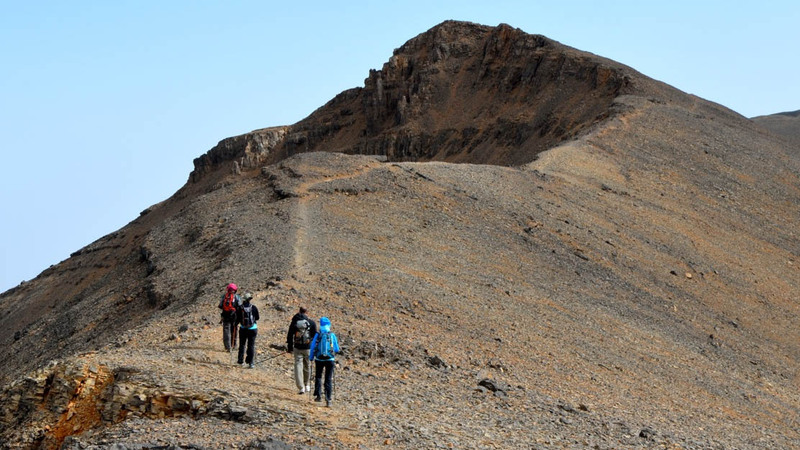 Azourki is the sacred summit of the central Atlas Mountains. 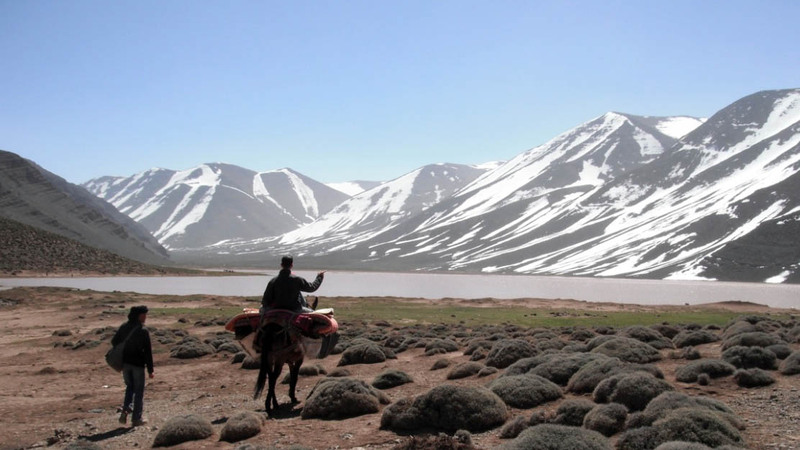 Perched above Lake Izourar, the summit looks over the « Ait Atta » nomadic peoples during their summer transhumance. Before disappearing, the path crosses a forest of oak trees, at which point we will need to continue off the beaten track before reaching the summit. The climbing is not difficult, as long as you’re in decent physical shape. At the top, the view over the M’Goun mountain range, the Tadla plain and the Middle Atlas mountains is positively breathtaking. Tabant, the economic center of the valley, is locaed some 20 kms from the Touda Ecolodge. 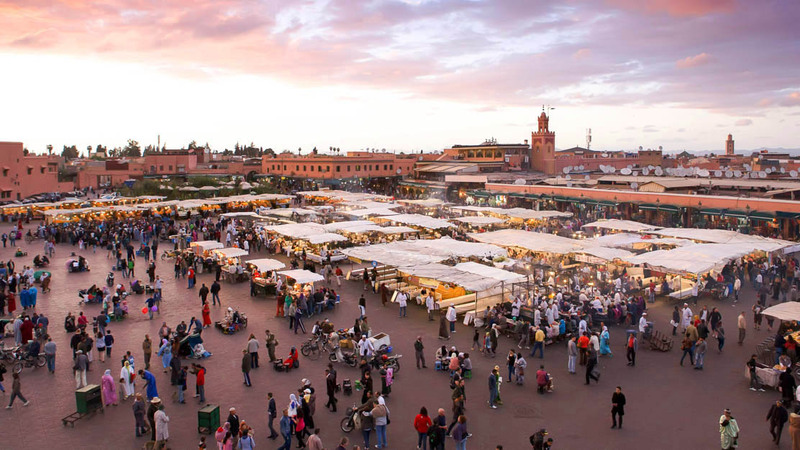 Sunday is the day of the renowned « souk », an important meeting place for the locals in the valley, who come by foot, on donkeyback, or in communal taxis. After lunch, we climb up the valley towards the headwaters of Ait Imi, before coming upon the enchanting village of Ait Imi and its seven water mills. We then return to Touda Ecolodge at the end of the day using public transport. Discovery of the local lifestyle and of the villages in the high valley of Ait Bougmez. Lunch with a Berber family in the village of Ait Ouchi. 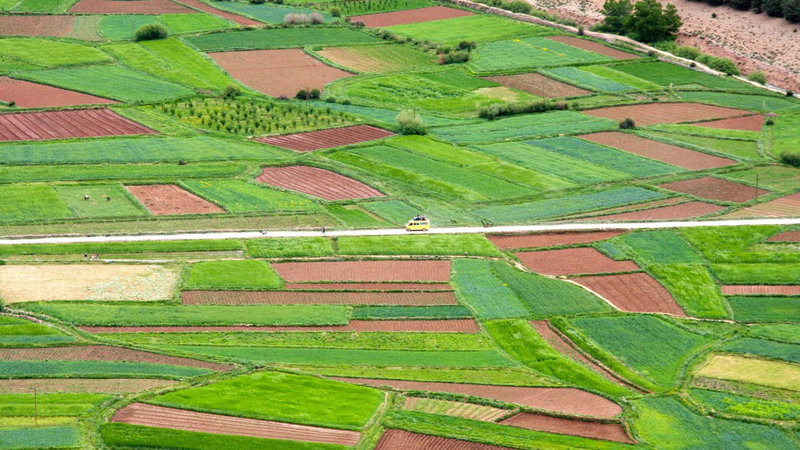 In this region, known for its cultural and architectural riches, daily life revolves around the crop fields : well maintained areas, picturesque shouting by the plow driver, women collecting alfalfa for the cattle. Foodies can take part in the preparation of a traditional meal. 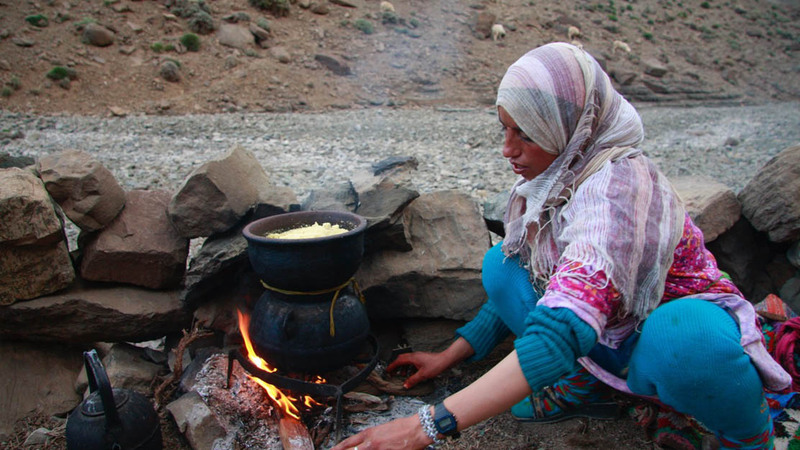 Combining traditional Berber, Arab and even Andalusian recipes, Moroccan cooking is righlty considered as one of the most mouth-watering and sophisticated cusines of Northern Africa. We suggest that you savour this exquistite cuisine in an exceptionally charming setting. Cycling : Mountain biking discoveries in the Bougmez valley, from village to village, through wide tracks and narrow curvy paths. At the end of the day, enjoy a traditional hammam: infuse the healing aromas made with ghassoul, black soap, rose water and aromatic plants. Festive dinner for the last evening and night at the ecolodge. We leave the Berber world for the kaleidoscopic wonders of Marrakesh. During the trip, we stop at the Ouzoud waterfalls, the highest in all Morocco, an ideal place to relax. Arrival at Marrakesh and check into your riad. 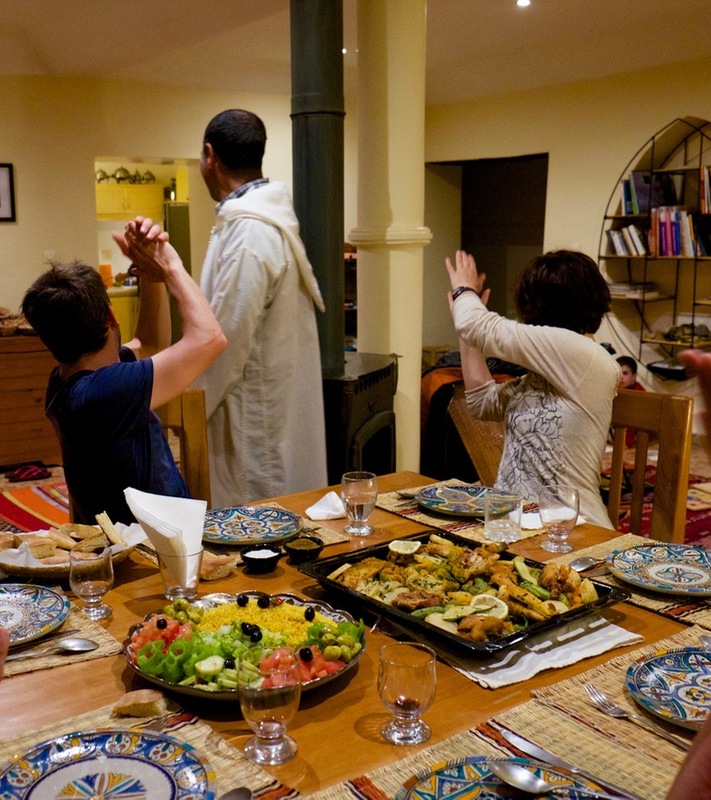 Dinner and evening at your leisure in the riad. 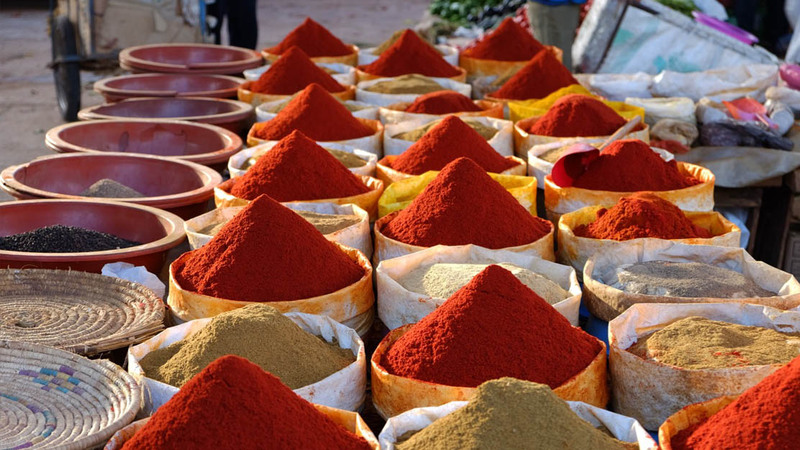 Last visit of Marrakesh, depending on your departure schedule. Transfer at the airport for your return flight. Some extra days in Morocco ? After this trip, you can extend your stay in an authentic riad, in the heart of the Medina in Marrakesh, or the Medina in Essaouira, overlooking the Atlantic Ocean. Would you like to get to know us a bit more? You can read our blog and get an idea of who we are, why we are here and how and why we are doing what we are doing. Take a virtual tour in our Photo Gallery, watch some clips on YouTube or read TripAdvisor reviews to see what our guests have to say about us. But if you really would like to know what Touda Ecolodge is all about, the best option is still to stop by. We are looking forward to your visit.